Why can’t we be honest about healthcare choices? Marcus Longley advocates honesty, clarity and choice in the “marvellous, frustrating” Welsh NHS. Which Welsh Muslims are we listening to? Abdul-Azim Ahmed outlines the diversity within Muslim communities in Wales and laments the lack of nuance in the dominant media narratives. Seb Cooke meets Kay Harris, a south Wales grandmother who has found herself, through circumstances, at the forefront of a campaign to fight the everyday ravages of the Bedroom Tax. How feminist is the Welsh Assembly? Liz Silversmith surveys the facts and asks some difficult questions. George W. G. explores the migrant experience from the inside. Manon George and Huw Pritchard say recent announcements on the Wales Bill are encouraging. 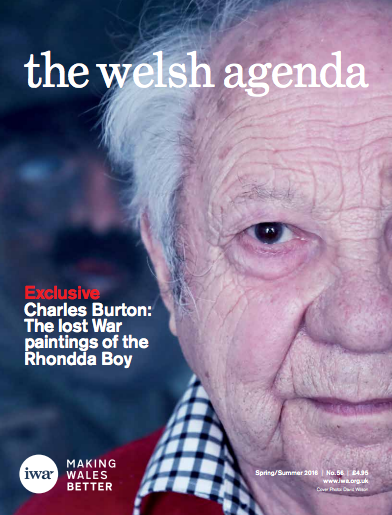 Tony Curtis uncovers the Rhondda Boy’s unseen war paintings. Wales, a Paradise for Artists? Amid the currents climate of cuts to art funding, Iwan Bala argues that we need to remember the rich history of our visual art. City Regions- Deal or no Deal? Ieuan Wyn Jones outlines the implications of an English Northern Powerhouse for the north of Wales economy. Welsh Wizzard… Gentle Giant… Golden Gareth? As Wales’ footballers prepare for Euro 2016, Dylan Moore goes in search of the superstars who prefigured the world’s most expensive player, Gareth Bale. Lord Paul Murphy talks to Dylan Moore about why Wales has an Oxbridge problem, the Seren priject that aims to support Wales’ brightest- and how we might eventually tempt those graduates back. Rhea Stevens gives a personal reflection on her time at Oxford. As one of the Assembly’s stalwarts- and most divisive figures- retires from office, Rhys David runs the rule over Mrs Hart’s record as minister for economy, science and transport. Dewi Knight provides an insider’s profile of the Welsh Liberal Democrats; outsider- insider and survivor, party leader Kirsty Williams. David Pountney explains the sense of destiny behind Welsh National Opera’s forthcoming adaptation of David Jones’ epic poem of the Great War, In Parenthesis. Colin Thomas explores an altered media landscape to find Wales catching up with the present. Simon Brooks and Geraint Talfan Davies discuss “the Cardiff effect” , local government reorganisation and the future of the north. Seeking God’s Kingdom: The Nonconformist Social Gospel in Wales 1906-1939 & Rhys Lewis: Minister of Bethel.